Welcome to the way of words. If you need a writing problem solved, contact me. A few months ago, my friend Azusa and I sat with our smart phones in a crowded Omotesando yakitori bar. 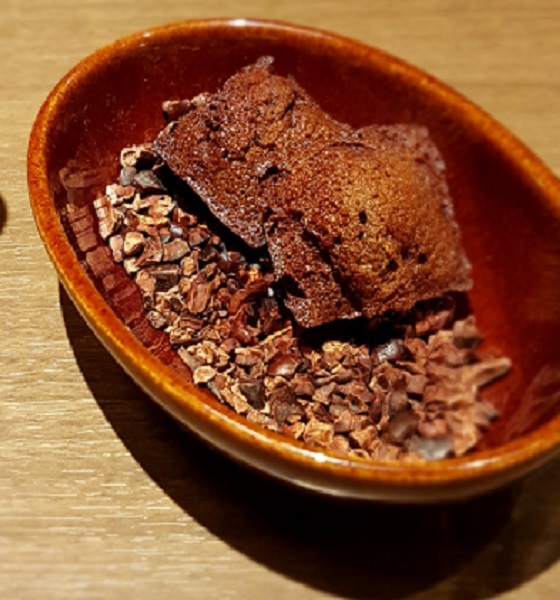 Between delicious skewers of chicken, various delectable side dishes, wine and Japanese highball (a whisky-based soda drink the Japanese have reinvented and made their own) we listed flowers I loved and a few she suggested. Then we considered their Japanese names. Question: Why were we doing this? 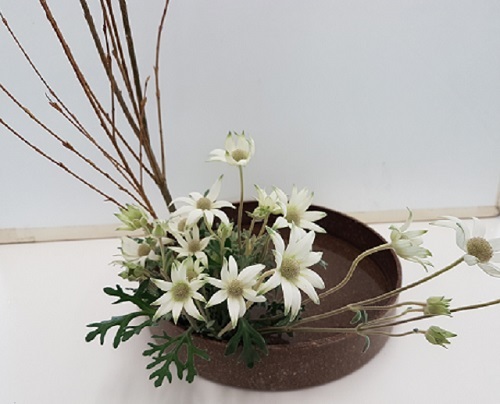 Answer: When I finished Level 4 of Sogetsu Ikebana and applied for the certificate of completion I discovered that I was expected to choose a flower name for myself. That is no simple task. I didn’t get to choose my own name, its sound or its symbolism. However, in choosing a flower name I felt compelled to find a flower I loved which was emblematic and also sounded mellifluous in Japanese. I was surprised at how many flower names sound quite spiky and harsh in Japanese. At evening’s end only two had made the list. I spent the next days considering additional flowers. Thankfully, the information required was at my fingertips. With a few clicks and swipes I checked and eliminated various options in two languages. Throughout the process one flower of the two Azusa and I had on our shortlist continued to resonate. Gentian. An autumnal flower, it has been extensively bred by the Japanese to produce a wide range of variations and colours that are at once strong, soft and elegant. In addition, the flower’s Japanese name Rindou (or Rindō) is similar to the way my name Lynda is pronounced in Japanese: Rinda. That done, another more daunting task remained. I needed to choose Chinese characters for the syllables Rin and dou. Complicating matters is that any given Japanese syllable can be rendered in multiple Chinese characters. These often carry more than one meaning and may change pronunciation in Japanese. Not knowing Chinese or Japanese and not wishing to choose something which unbeknownst to me might harbour some dodgy or ridiculous connotations, I solicited the help of friends who were knowledgeable in these matters. However, even for them the numerous options could be confusing. For many weeks I considered suggestions and advice, including the recommendation of the Services for the Membership Department staff at Sogetsu Kaikan who administer the certification and issue the diplomas. Eventually I went with their recommendation and chose these characters 竜胆 meaning (among other things) bold. The choice was sealed by additional pertinent element I discovered during my extensive research. 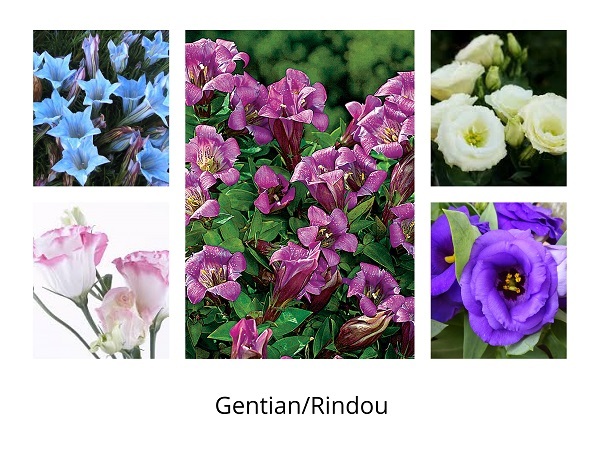 The autumnal gentian’s ravishing colour and highly nuanced symbolism are referenced in an Emily Dickinson poem “God made a little Gentian.” The final line asks: Creator—Shall I—bloom? I shall–indeed! Boldly! Here’s to my new flower-name and all ravishing, late-blooming creators. When astronauts return from time spent in space, how do they react to their return to earth? The Human Research Program at NASA notes that astronauts experience various disturbances to human physiology as a result of sleep disruptions, confined environments with limited social interactions at long distances from home which have predictable effects. Without belaboring the extensive research, an astronaut’s experience in space can include strain, distress and negative states of mind requiring medical intervention. However, it can also contain joyful highs, a heightened sense of beauty and wonder, as well as the feeling of being connected to a larger whole. On return to earth it’s not uncommon to experience shifts in mood states in spite of the growth-enhancing experience, changed perceptions and the pleasure of coming home. 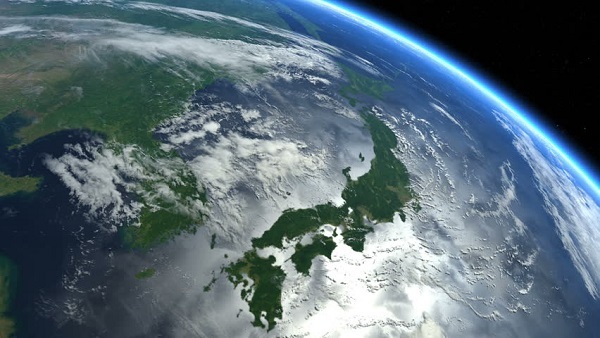 Though I don’t equate a 10-hour flight to a destination on this planet to space flight, I am not surprised to find parallels with my state of mind four months after my return from Tokyo. Sleep disruptions, confined environments, limited social interactions were characteristic of my experiences abroad, too. However, a difference between me and astronauts was that I had no home or homecoming to anticipate with deep joy. Though I wasn’t living rough by any means, after two and a half years in Victoria I was not yet settled. Essentially, I still felt homeless. Joseph Campbell in his seminal work The Hero’s Journey describes another point regarding returnees once the quest is over. On his return the hero finds himself quite out of sync with those whom he left behind. Similarly, in addition to feeling homeless, after leaving my intense and often rapturous program of ikebana studies and Tokyo adventures I found no one with whom I might fully share my experience. Fortunately, on my return to Canada I had major undertakings to fully occupy my mind which protected me from any serious downward plunge into variable mood states or adjustment disorders. 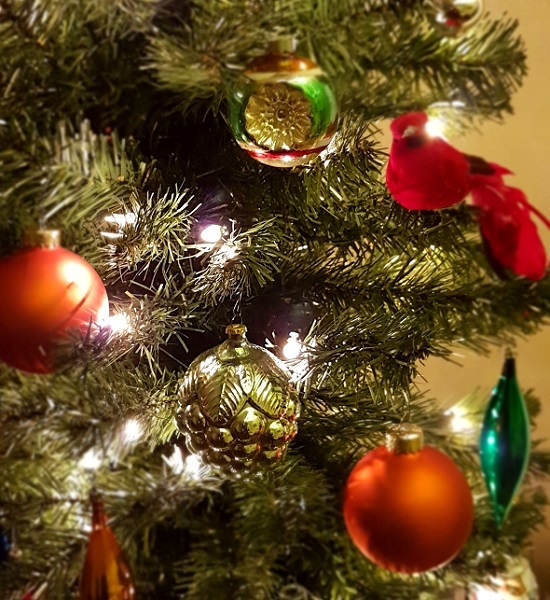 As described in my last two posts I began a search for a property to call home and plunged into Victoria’s broad range of Christmas festivities. Even though I had not yet found a suitable property, as a gesture of faith and concrete intention I started packing on Boxing Day. 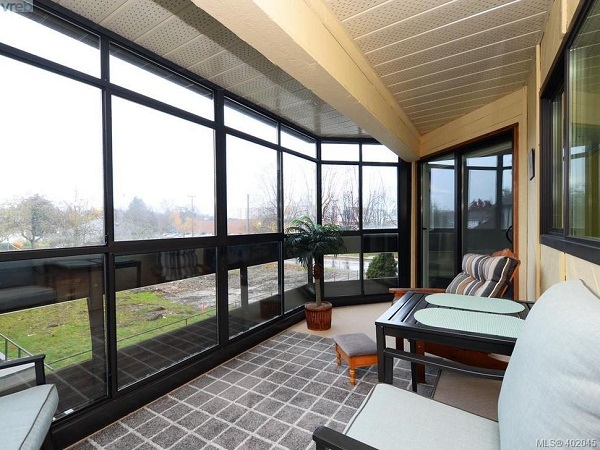 Shortly after New Year the offer I made on a condo was accepted, and day by day I ticked items off my To Do lists in preparation for the possession date before month’s end. Yet, before the ink was dry on the documents, thoughts about whether it might also be possible to return to Tokyo drifted in and out of mind. Email conversations with the school liaison regarding my certification documents and the choice of my flower name (which I will get to in another post) prompted night dreams of fellow students at Sogetsu Kaikan and the streets of Gaiemmae where my spirit wanders still. 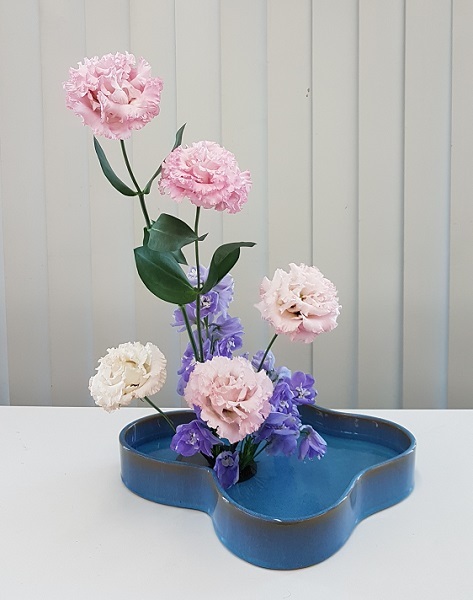 Though I am continuing my ikebana studies in Victoria, after Anne and Aude from International Class sent photos, yearning for the Tokyo classes I deeply miss grew. I wondered whether I could manage a return to receive my certificates from Sogetsu Kaikan in person rather than having them sent by mail. That tantalizing prospect has also been intensified by frequent longings for CITRON’S matchless lemon tarts. Nothing comparable exists here. My last morning in Tokyo before heading over to Shinjuku Station where I caught the JR Narita Express to the airport, I left my apartment and wandered around the corner to CITRON. 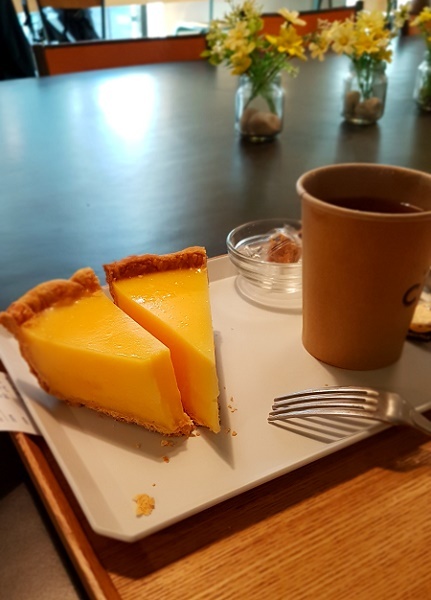 Since I wasn’t going to enjoy this indulgence again for a long time, I ordered two slices and asked Benjamin to plate them to look like a single slice. He laughed when I confessed sotto voce that I didn’t want to suffer any Japanese side-eye over this foreigner-style excess. But I digress. 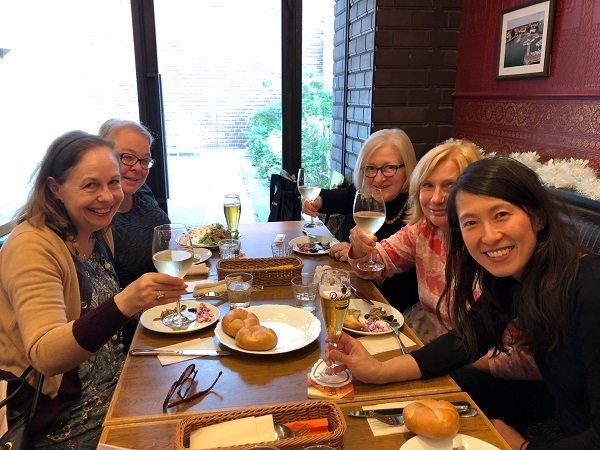 Even during moments fraught with frustration and the significant challenges inherent in stepping out of my own culture and language, my Tokyo days were out of this world. Not perfect. Not always ideal. 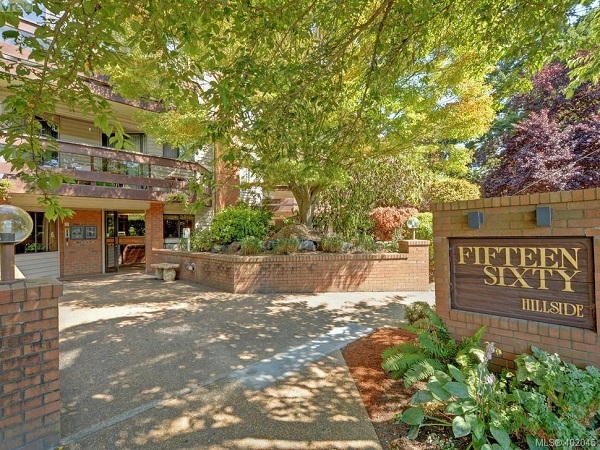 Nothing I should consider superior to the life I relish in my new home in Victoria. However, my Tokyo time was most definitely a matchless interlude I cannot replicate on this side of the Pacific. I can’t walk into a classroom with resplendent views, take instruction from numerous top-tier teachers or enjoy as many as seven (though I usually took five) classes each week. Here I also study with a nice group, but that number of weekly lessons is spread over three months. In Victoria I also don’t have the vast choice of materials grown especially for ikebana or full range of supplies on hand. 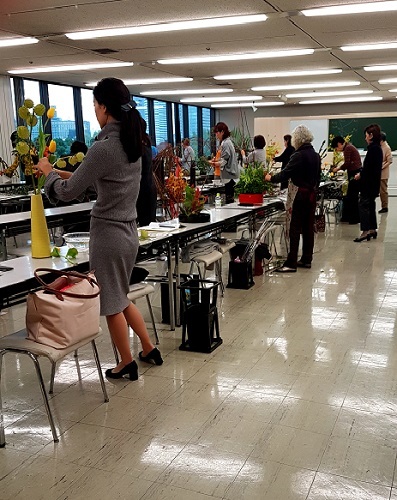 In addition, I miss the connection formed with kindred spirits I chanced to meet and ikebana artists who found their way to Sogetsu Kaikan from all over the world. Women whom I grew to admire and cherish over the five months spent together. Then during the time outside of class, the city and all its myriad offerings—high and low, sacred and profane—beckoned. I’d be a poor specimen of a sentient being not to miss it all. 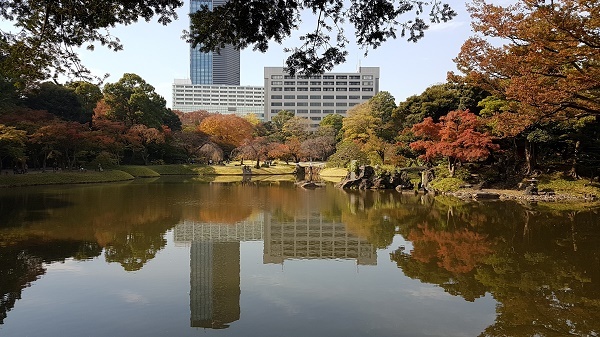 As a result, I will return to Tokyo-related themes on this blog as I get settled in my new home. Some of the stories of my Tokyo days remain untold. Though part of me questions whether it’s not too much of a bygone after all these months, another part wants to keep that out of this world experience alive. 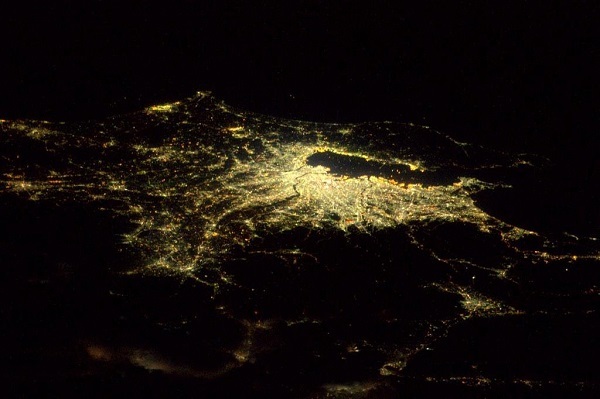 *Photos of Japan from space used with permission. NASA & Shutterstock. Since acquiring my new home I have been busy. Creating blog posts has not been priority one. Instead, I revved up into high gear the moment the keys were mine. I immediately called in Fuzzy Wuzzy Carpets a local firm (which has been around for more than 40 years and comes highly recommended from multiple sources) to measure the suite and balcony for new carpet and lino. 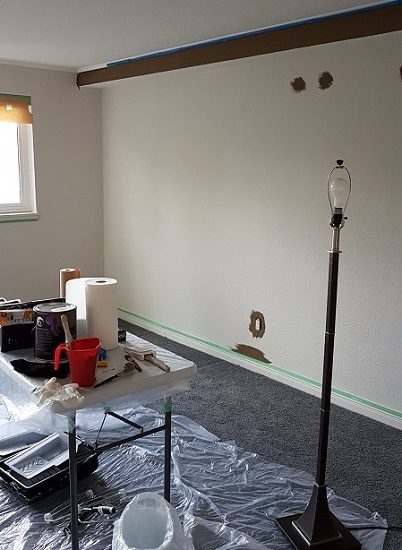 I removed the switch plates, prepared the walls and taped off the trim in the hallway, great room and master bedroom before painting. 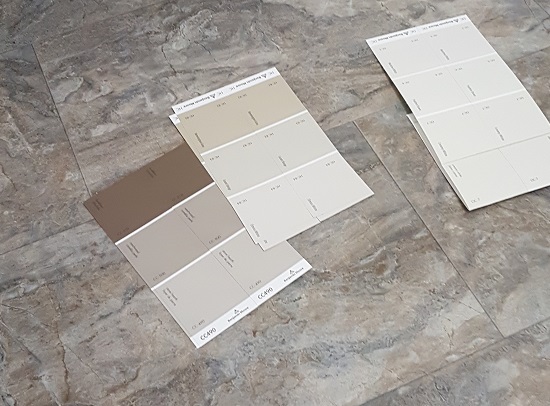 Over the next weeks I applied Benjamin Moore Aura paint in the same palette my friend Cindy Schafer of Schafer Design and I had chosen for my Abbotsford condo. The colours are already proven. In addition, they will immediately feel homey psychologically as well as show my furnishings to best advantage. Between coats and touch ups I cleaned, lined shelves and drawers, researched options for light fixtures and other items I wished to swap out or needed to acquire. 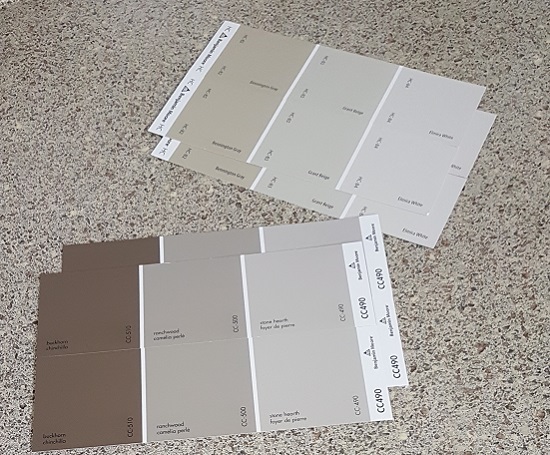 Victoria Blinds and Closets were able to tweak their modular closet systems the previous owner had installed to my needs. Brilliant! At some future date I will call on them to reconfigure the entrance, laundry and linen closets in order to maximize my storage space. Kitchen Technician will swap out a useless (to me) open kitchen cupboard for one with glass doors, install a lazy Susan where a gaping cavern exists, and create a storage tower in the ensuite bathroom. I bought an over the counter microwave oven small enough to fit the space for it as well as a Toaster-Convection oven that will be a more efficient use of energy than the regular stove for small-scale meals like mine. By a wonderful stroke of luck, I found ready-made black-out curtains and matching rods for the master bedroom that look rich but aren’t expensive. You got to love it when that happens. I scheduled my moves from my leased suite to the condo and the furnishings I have in storage in easy to manage stages and kept on packing. Until the carpet is installed, there’s no point taking things over and shuffling them about multiple times. However, they’re ready to go. During this time I’ve also been able to take breaks, read books, have fun and enjoy the company of friends. Once fully moved in, I look forward to sharing before and after shots. Today is much like one of those evening flight, waiting-around-with-nothing-to-do at the airport days. Except that no one is going to bring me drinks once I’m on board. In 9 hours I get the keys to my new home! I’m thrilled in a weirdly calm way. Sort of the way I am when I’m about to fly to Tokyo for a couple of months. People constantly ask: Are you excited? Well of course. There’s a serene knot of happiness at the core of my being at the prospect. At the same time I’m cognizant of the work involved in the enterprise. That sort of puts to rest any giddiness I might indulge. Fortunately, I enjoy the work. I especially like interior design projects, and can’t wait to add my personal imprint to this property. I welcome the challenge even as I feel its magnitude. Most large-scale beginnings are like that, I think. But when undertaken in manageable, sequential micro-bits and approached with joy it’s anything but daunting. Bring on the bliss! 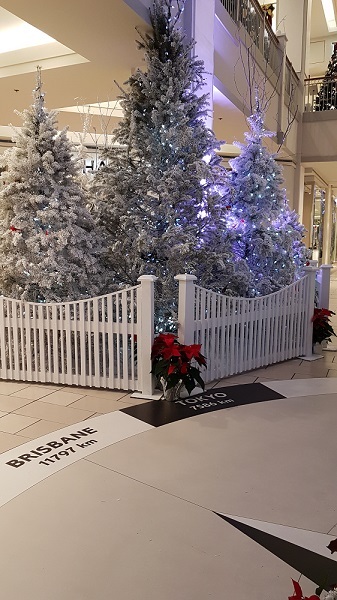 I was surprised during a visit to a local mall to view a Christmas tree display to find a compass rose pointing to Tokyo more than 7500 kilometers distant. Sometimes it feels as if it were that many days. I’ve been back three weeks now, decking my own halls, checking out the local concerts, events and reconnecting with family and friends. I’m especially grateful to enjoy Christmas in accommodations with central heating and adequate insulation this year. No drafts blow the candle flames to a horizontal 90 degrees and no buzzing heaters are needed here to keep things toasty inside. Outside the weather has (except for a few crisp and clear days at the beginning of the month which were so like Tokyo’s winter season) been soggy and stormy. December is Victoria’s rainiest month and devastating winter storms have come on shore this year. Ferry sailings and flights during the peak travel season have been delayed or cancelled. Trees fell making a mess of the roads and causing lengthy power outages, some for several days and still unresolved, in the region. The streets are littered with branches—an ikebana artist’s bonanza. However, my apartment is too small to accommodate more than the Christmas tree, Advent Wreath and crèche in the window. My Victoria Ikebana lessons begin again in January. I’ll have to wait until then. Not all of the Tokyo stories have been told, and I’ll continue with tales of those delights after the merry making is done. Until then, best wishes for a Good Yule, Merry Christmas, Joyeux Noel! Over the years Anne has been a splendid dinner companion with whom I’ve enjoyed numerous restaurants in the Vancouver area. There’s never been a dud among the numerous options she’s suggested. She was taking her first trip to Japan in the final weeks of November, and we happened to be in Tokyo at the same time. 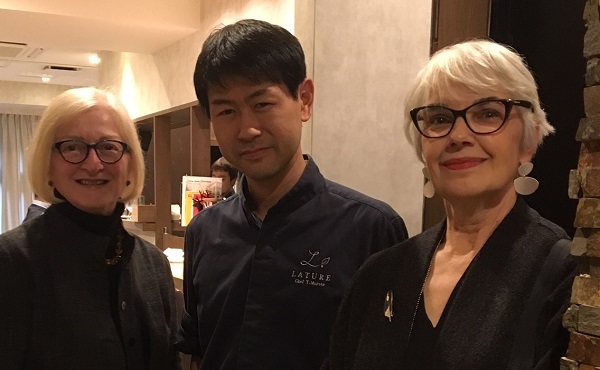 She wondered whether we might visit Lature, a Michelin starred restaurant specializing in Japanese game with a young Chef Takuto Murota at the helm. His accolades are numerous, including third place in the 2019 French Division for Tokyo restaurants. However, Murota is quick to share the credit for his accomplishments. He lauds the producers, foragers and hunters who send him great ingredients, vendors who hear him ask the impossible and deliver, repeat customers who offer advice, and his staff whose hard work and long hours make awards and Michelin stars possible. On arrival we were shown to the best table in the house, offered complimentary glass of Antech Blanquette de Limoux Brut Nature, and the feast (a set menu for which any allergies had been taken into account when we made the reservation) began. 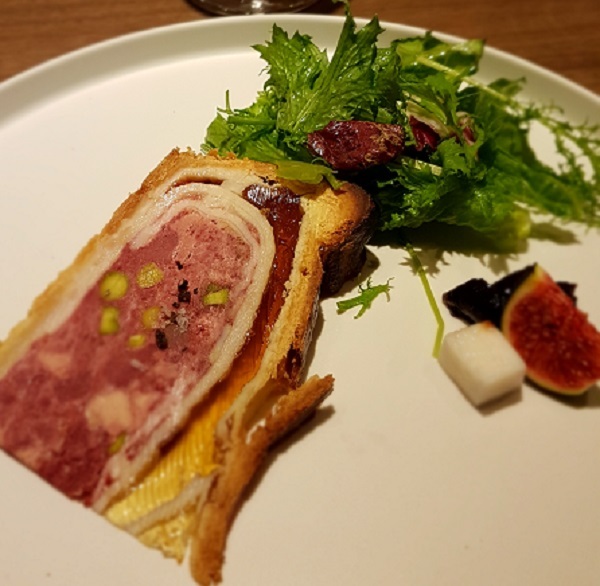 One of the more intriguing aspects of Lature is that Murota hunts his own game in Hokkaido and prepares the game dishes for Lature in the French tradition. The menu varies with the seasons and is presented with charming, distinctive touches. 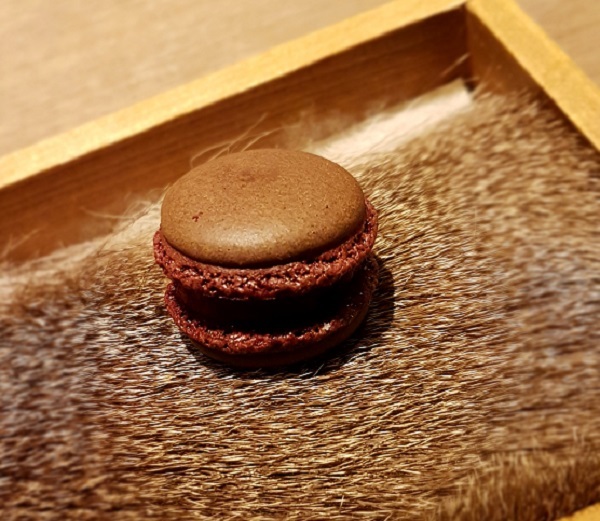 Deer blood macaron with black pudding filling served on deer hide. 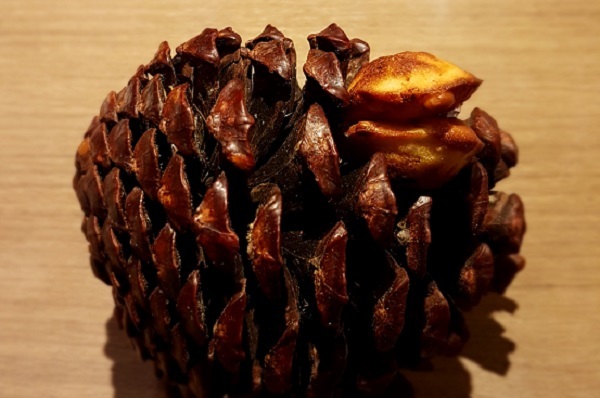 Savoury Madeline-like biscuit with deer salami filling served on a pine cone. 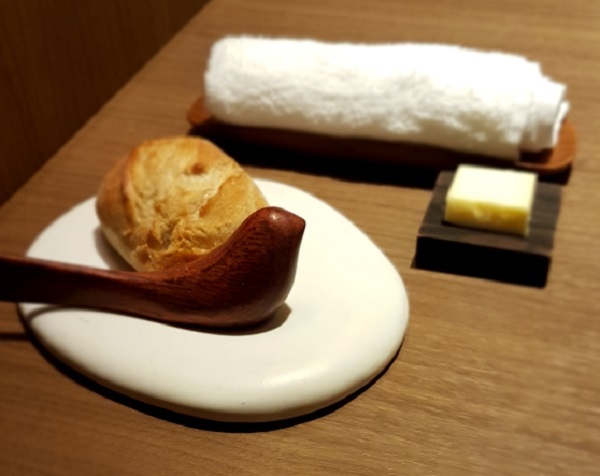 House made roll and Hokkaido butter with a carved bird butter knife. 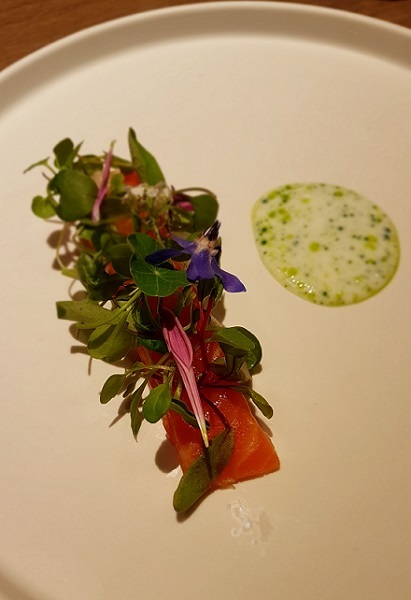 Smoked salmon, micro greens and flowers. 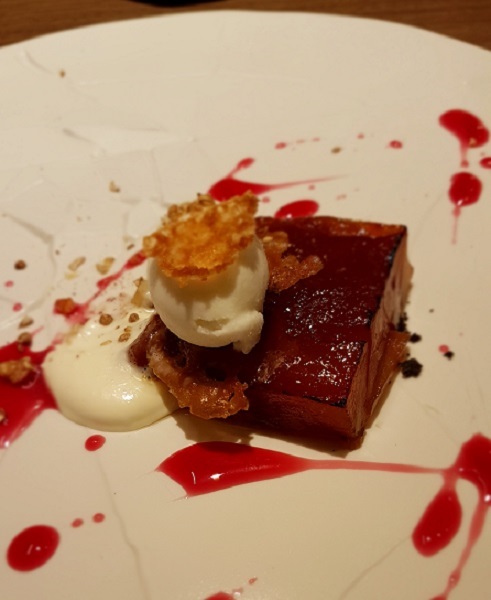 At this point of the meal we ordered a glass of Domaine de la Juvinière 2015 Savigny-Les-Beaune AOC Grand Vin de Bourgogne and proceeded with the next courses. Pate en croute made with deer, boar, badger and bear; deer consume gelee and prune compote. Deer loin with juniper, black pepper and currant sauce; celariac on the side; mushrooms, carrots Japanese white turnips, and micro greens. 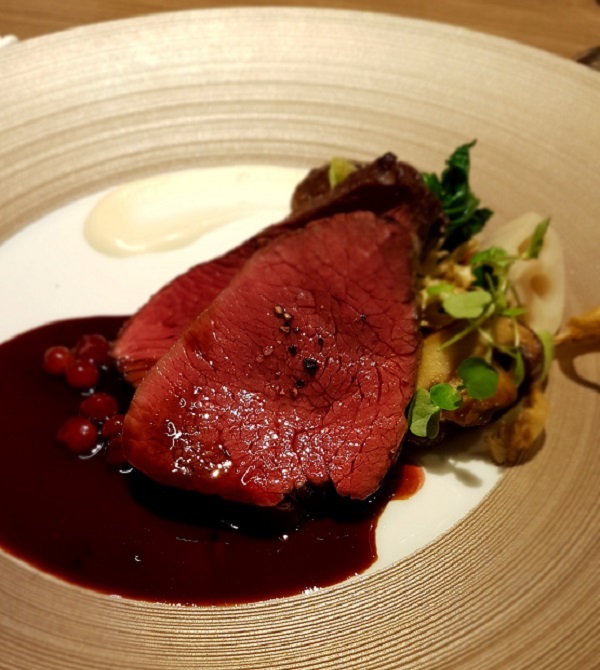 For the main course we selected a glass of Maxime Graillot 2016 Domaine des Lises Equis Crozes-Hermitage. Two dessert courses followed. Confit apple with creme fraiche. Caramel, pine nuts, walnuts and cocoa nibs. Fortunately, we had scheduled a good deal of walking after the sumptuous meal–a memorable interlude and matchless food experience. Apologies for all the accents omitted from the French text. And deepest thanks to Anne who kept better notes than I of the food and wine details. 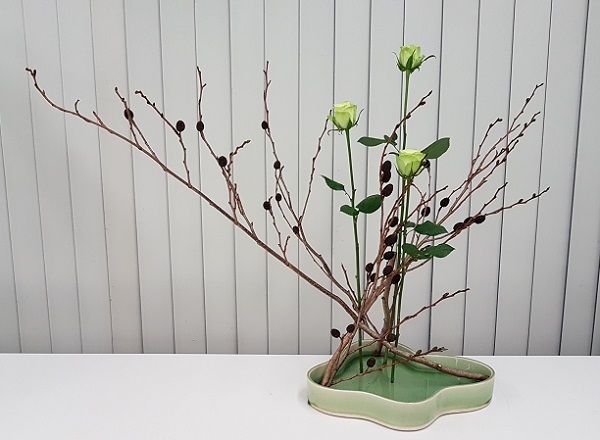 Alder (Alnus) branches and long-stemmed green roses (Rosa) in a green suiban (flat dish). The morning lesson went badly. Without a doubt it had to be the worst arrangement I have ever made. And that’s not coming from inner Tiger-mom. That’s straight from me. I’d been rather excited by the prospect as I had by great good fortune caught pruners culling dead bamboo from the grove leading up to Baisoin, the small Buddhist temple I passed each day on the way to Sogetsu Kaikan. I’d begged branches from them and thought all would be well after that bit of luck. I wouldn’t have to purchase additional branches in order to create a framework on which to execute the design, one that hangs on the wall. The delicate bamboo was a gorgeous gold and a pleasure to touch. However, nothing clicked. The mess I’d made of the design was nothing less than deeply embarrassing. Plus a terrible waste of the exquisite bamboo. Sigh. When he arrived at my station to evaluate my effort as the whole room watched, I asked the teacher-interpreter to apologize to sensei for wasting his time. However, she refused to speak. He stood silent a long time while I cringed. Silence can be the worst condemnation. Eventually he asked whether the eucalyptus I had used was fresh or dry. I answered that it was fresh now (a requirement of the lesson) but would dry nicely. Eventually he said dai jobu desu and moved on. Dai jobu desu can mean many things. However, in this case it was used in the way that you’d encourage a kid who’d wobbled a half a meter before falling off her bicycle. You say no problem, it’s fine when it’s no success. Plus, you know it won’t be the only tumble she’ll take before she eventually gets the hang of it. Still, for the one who took the fall it smarts a little. On Tuesdays and Thursdays I regularly took two lessons in one day. Next in the course sequence I had another challenging lesson. Initially I had thought to defer the tricky one to the next day, and swap it with a freestyle one that is more flexible as I am always sharper in the morning. However, following this fiasco I figured I might as well do the difficult one after lunch. That way, if it bombed I would ruin a single day rather than two. 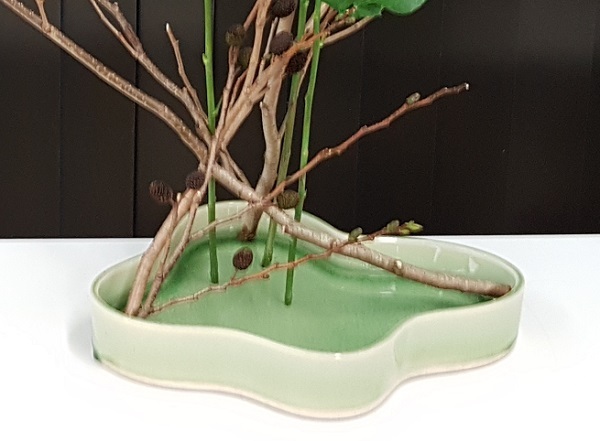 4.18 Branches in a Suiban Without Kenzan is an arrangement in which the branches must balance against each other and the sides of the container and hold their position. The flowers must stand upright on their bases between the branches without a pin frog to hold them in place. Students (as well as demonstrating teachers) work with assistants to hold the branches during the assembly of the design. Wire is also used to secure the branches to each other and keep them from slipping out of position. Being first in line for the afternoon registration, I was able to claim the single bunch of stunning green roses which had caught my eye. Those matched a softly curved suiban I’d noticed earlier and would be a good weight to balance among the alder branches. I’d been watching other students use those with their striking cones all week and was keen to try them. Together with one of the assistants who helped me to hold the branches steady and wire them together, I set to work. Once the branches held their position I cut the roses straight across and set them in place on their stems. Then as I removed minor branches and a few cones in order to create better lines and spaces, I discovered that alder cones drop little black seeds into the water when jostled. In ikebana, water is treated as a design element. As such it should always be beautifully clear in order to reveal the bottom of the container, reflect the foliage or create a sense of space. Fishing those bits out without knocking the whole structure off balance or more junk into the water wasn’t easy. That’s the major reason why, after standing back to consider the design elements, I didn’t remove a few more cones and branches. Too risky. Too late in the lesson period to fix it if the house of cards collapsed. Instead, I gambled that the detail might go unnoticed during the evaluation. In every other respect the result was spectacular even if I said so myself. How gratifying to achieve this quiet, simple elegance after the morning’s miserable flop. Inner Tiger-mom gave me an A-plus, and we gave each other an inner high five while other students gathered around to admire the result. In contrast to his earlier silence, sensei couldn’t stop talking about this arrangement, especially since it was the first one of this type I had ever attempted. He pointed out its various merits to the class. Only two wires! Wonderful container colour and harmony with the unusual roses. Lovely perpendicular lines of the roses. Excellent choice of branches for movement and colour. Kire! Beautiful! Omedeto! Congratulations. He didn’t mention the stunningly clean water. However, he also didn’t point out the small swamp in the suiban of another student behind me who was working on the same lesson. After I noted that, inner Tiger-mom gave me an upgrade to Super A-plus. Alas, from high to heartbreak, the work had to be struck down moments after sensei finished praising it. Sigh. 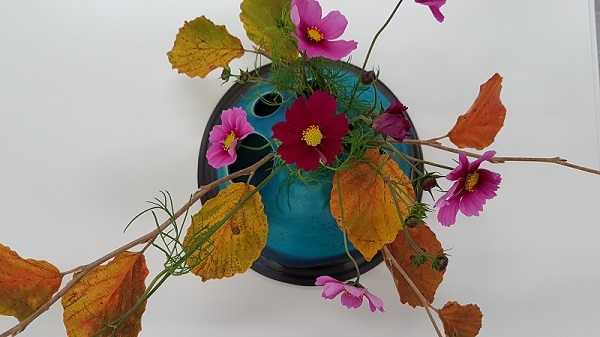 Japanese witch hazel (Hamamalis japonica) branches and cosmos (Cosmos), also known as the cherry blossoms of autumn in Japan, in a two-toned blue container with five openings. In an arrangement for a low table or the floor, the objective is to create beautiful line and a composition which is attractive from any viewpoint. Since I got pushback in an earlier lesson for choosing dark colours, for this enterprise I decided to go boldly. I chose the container for its colour and the fact that it could accommodate a kenzan (spiky frog) to hold the cosmos and the branches. The five holes in the vase also allowed me access to the kenzan from multiple points making it easier to create an all-around design and easily hide most of the kenzan under the ceramic without needing many leaves to do the job. The red, gold, orange and green tones in the leaves together with the magenta and burgundy in the flowers hit every segment of the color wheel. Sensei’s verdict? Omedeto! (Congratulations.) All points excellent. Though in ikebana it doesn’t always count as success to think so, I liked it too. For example, I liked the rich and rusty tones of an earlier work more than sensei did. Sometimes it’s a matter of preference and not necessarily rightness. Other times it’s failing to hit the execution of the theme even though the arrangement may look fantastic to the untrained eye. I’m constantly impressed by how the top-level master teachers assess each student’s work, then remove a leaf or shift the kenzan or add a small branch and create something splendid where originally there was something very good. Asparagus fern and mauve Phalaenopsis orchids in a three-throated, cream-coloured, tubular vase. Some arrangements are placed above eye level and the composition must reflect that point of view. We don’t always get asparagus fern. Luckily this day we did because it drapes wonderfully and has natural depth. However, I also emphasized the line and depth by pruning dense parts and adding branches in the back. The fern’s airy nature softened the heavy container which I chose for its interesting shape and in order to ensure stability in the arrangement. 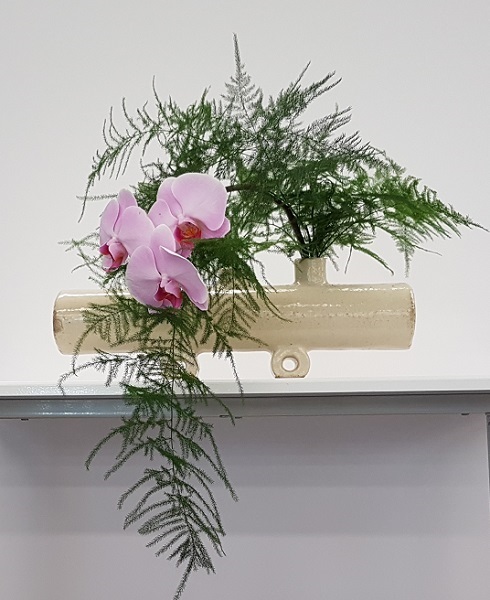 In addition, the three narrow throats in the container allowed me to insert the pliable orchid stem deep into the tubular vase in order to counter the effect of gravity on the heavy blossoms. I removed all but three flowers from the stem and bent it into a curved line before inserting it into the neck of the vase. This was one of those arrangements which came together in a few minutes. I agonized over that while waiting for the evaluation. It’s difficult to trust something which seems too quick and easy. Sensei and others in class loved it. It was also one of the heart breakers. At the end of the hour it was wrenching to tear it apart. 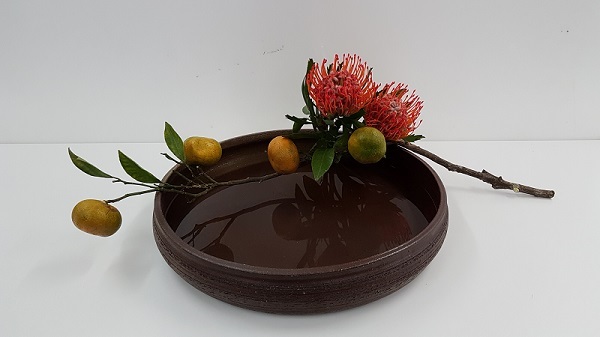 Fruiting Mikan (Citrus unshiu, or satsuma mandarin) and Pincushion Protea (Leucospermum) in a brown pottery suiban (flat dish). Not fixed with a kenzan (spiky frog). In this arrangement attention is given to the water as the primary element. The water can also be featured in transparent vases and styles other than flat, spreading containers; however, a large suiban makes the emphasis of the water element more obvious and eliminates the need to address the composition inside a transparent vase. That said, it doesn’t necessarily make the arrangement easier. Branches don’t always behave as you might wish. I chose autumnal colours for this arrangement as well as strong branches and flowers which would be stable in the arrangement. I had wanted to work with some of the larger fruit I can’t source in Canada which is available to us in the Sogetsu Kaikan classroom setting. Unlike 2— Variation No.7 which also emphasizes the water element, in this instance the flowers do not need to float. They can be fixed with or without a kenzan. To my surprise I got pushback on the colour of the container and was asked to consider using red, green or blue. I happen to love dark, rich tones, plus they are seasonally appropriate. However, we don’t have optimal lighting or noise-free conditions in which to photograph our work at school. 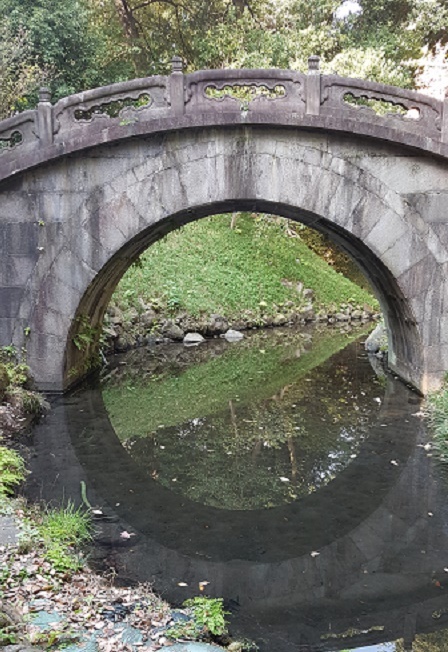 Therefore, the autumnal flowers, fruit and leaves are much more vibrant and reflections in the water clearer to the eye than what the camera captures. I did as Sensei asked and imagined containers with colours that pop. I could see the difference such choices would make to the composition; however, couldn’t get on board with any of those options. Interesting, last year a different Sensei remarked on my exceptional sensitivity when I chose a mottled brown container and combined it with subdued blossoms. Rule 33 from The 50 Rules of Sogetsu Ikebana by Sofu Teshigahara the founder of the Sogetsu School states: Select a container that accentuates the beauty of the ikebana arranged in it. As beauty is said to be in the eye of the beholder, why not pick the colour which would do it for you.